More than 20 years ago, Lemonade Stand emerged on the Apple II as a means of teaching the children of Generation X basic economics in schools across the country. 29 years later with the help of Maverick Software and Mac-gaming mainstay Glenda Adams, Lemonade Stand is back for both children and nostalgic older audiences alike on the iPhone and iPod touch. 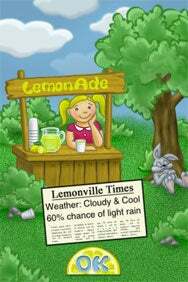 Open For Business: It’s got a more modern look, but Lemonade Stand is the same game you might remember from the Apple II, right down to the fluctuating weather conditions. Like the original, players begin with a budget of $2.00 and 30 days to earn as much money as possible while facing fluctuating weather, traffic, and economic conditions that may help or hurt business. Before the start of each day, players must decide how many glasses of lemonade to make, how much to charge per glass and how many signs to post to help with advertising. It’s the variables that make things interesting, as the market changes every day. A thunderstorm could drown out business, a traffic jam could reduce the number of potential customers passing by, or the cost of lemonade could increase without warning. Lemonade Stand offers a choice between graphics templates; users can opt for either the revamped, polished graphics designed for the iPhone and iPod touch or the blocky, classic graphics of yesteryear. Both modes and their accompanying animations come across well, and a good mix of music keeps the game entertaining. Not much has changed as far as gameplay is concerned—Lemonade Stand is still a fun, noble way to pass the time. After a few minutes of learning the basics, you’ll become immersed in the game and wondering how to make the most of changing conditions such as a heat wave or nearby construction. The economic element is still there, and if you figure out how to price your lemonade correctly, make enough of it, and advertise well given the conditions, you’ll finish each day with a good profit. While Lemonade Stand runs smoothly and incorporates some nice bells and whistles (such as an automatic save-and-resume feature and an online scoreboard), it runs into some problems that the developer could have tackled. A limited number of animations and repetitive gameplay get in the way of a truly enjoyable title; even something as simple as a choice of difficulty levels could have appreciably added to Lemonade Stand’s replay value. In the end, Lemonade does its job, is fun for short periods and worth its 99-cent asking price, but needs additional work and game modes to be compelling. Lemonade Stand is compatible with any iPhone or iPod touch running the iPhone 2.x software update.